This paint dries darker. I'm taking a bucket of white and adding the gold cup-by-cup. Not only does this create a custom color, it increases the total quantity of paint. It's a gorgeous color - happy painting! I sort of dread that feeling, well known to me, of standing out there in the garage, wanting to get started on my project, adding "just one more cup" to try to get the right color! And of course you can't really see it in the garage, and you don't want to schlep back and forth to your wall each time you make a small adjustment. Looking forward to seeing the result, I loved the yellow at your old house. That color looks like spring, so cheerful! And yet, it is so sophisticated too. Have fun! That mirror is really pretty! Can't wait to see the finished walls!!! We did this for our laundry room we started off with a miss tint green we got cheap but we wanted to change it some We were surprised how much paint it took to change the color of it very much .If you are not wanting it a whole lot lighter its going to take allot of white to add to it. A good tip is when you get the color you want paint a white index card with it. and label where its at then you can take it in and get it color matched. We did this when we mixed paint and needed another gallon and you couldn't tell the difference at all. I love yellow. 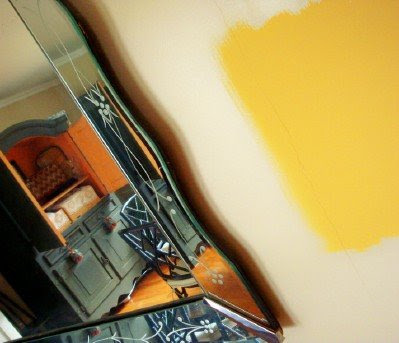 I have a pale, creamy yellow in my family room and a warm, golden yellow in a hallway and my living room. I like it so much, I wanted it in my bedroom, but with so much yellow, I thought I'd try something different. It was a disaster. I can't wait until we repaint, but at the rate we make changes around here, it'll take years. I'd better get used to the TEAL. Teal is pretty, but it's not me. Not in my bedroom. t'is looking good. Nice photo too. Yellow is my favorite color. It is so fresh! Is this just a spring spruce up or is time to sell again?